They envision a day where people with Down syndrome are fully included in their communities: working, playing, studying and living together with their peers. It is their hope that individuals with Down syndrome will be seen as ''More Alike Than Different' and strive to instill this belief in our local communities through our outreach and programs. This goal is to benefit the community as a whole, not just the individual. wellness professionals, parents, and caregivers alike. The Anat Baniel Method℠ is a cutting-edge, science-based NeuroMovement® approach that transforms the lives of children and adults, helping them move beyond pain and limitation. By accessing the amazing powers of the brain to change itself the method helps people discover how to improve the mind and body dramatically enhancing physical, cognitive, emotional, and creative performance. This unique method evolved from Anat’s background, the work of Dr. Feldenkrais, and the thousands of people Anat has helped. Through innovative movement exercises and the Nine Essentials, create new neural patterns that increase strength, flexibility, and vitality. Whether you are in good health or have a limiting diagnosis, the method gives you tools to make the impossible possible and to live life more fully, with greater joy and success. Early intervention programs provide an array of therapeutic and social services to families of young children with developmental concerns. These programs are based on the assumption that therapies and enriching experiences provided at an early age can help lessen the impact of developmental problems. According to a recent report by the FSU Center for Prevention and Early Intervention Policy, children not involved in an early educational program were more likely to be placed in special education, drop out of high school, participate in welfare programs, and have a greater number of incarcerations. Infants & Young Children West Central Florida, Inc. The INTERMEDIATE CARE FACILITIES FOR DEVELOPMENTAL DISABILITIES or children and adults with the greatest needs that cannot be met in the person's home. There is no dollar cap, and the needs of the children and adults are met in a community setting with 3 to 24 people per home. The BIG WAIVER is the Developmental Disabilities Waiver. This waiver doesn't limit how much can be spent per year, and offers all the services. The eligible person however must be planning to move into a group home or supported living environment within 6 months. There are some caps in the frequency of services and most services have specific guidelines that must be met in order to be able to receive them. The LITTLE WAIVER is the Family and Supportive Living Waiver. There is a limit to the number and types of services as well as a limit of $14,282 that you can spend each year. This waiver is for people who live in their own home, family home or a supported living situation and there are 11 services available. The Nemours Children’s Clinic, Orlando, provides comprehensive evaluation and treatment for children with genetic disorders. Learn more about Nemours Children's Clinic, Orlando. The Down Syndrome Association of Central Florida is a not-for-profit association, founded in 1991, by parents of children with Down syndrome. It has grown from a few families to over 9,000 individuals, families and supporters. We are governed by a volunteer board of directors (more than 50% have a family member with Down syndrome.) We serve more than 850 families in the 7-county area in and around Orlando. DSACF is the leading voice for individuals with Down syndrome and their families. We offer hope, encouragement and acceptance through advocacy, education and awareness so that each may realize their potential as members of our community. The Down Syndrome Association of Jacksonville (DSAJ) is a non-profit organization committed to helping people with Down syndrome achieve their full potential and to helping create a community that is educated, supportive, and inclusive of individuals with Down syndrome. In 2001, two parents of children with Down syndrome, Frances Capo and Lilianne Rossel, met through their genetic specialist with the idea of starting an organization for other parents to meet, share experiences, and get information about Down syndrome in Miami-Dade County. They both shared the mindset that individuals with Down syndrome are just that—individuals—people with personalities, ideas, and tremendous spirit.Their idea began with small fundraisers and their first event, a family picnic at a local park now hosted annually. That original idea, with the help of other like-minded parents, became what is known today as the Down Syndrome Association of Miami (DSAOM), incorporated as a 501(c)(3) non-profit organization in September 2005. The mission of DSAT is to provide education, support, and resources to individuals with Down syndrome, their families, professionals, and the community while building public awareness and acceptance of the abilities of individuals with Down syndrome. Gold Coast Down Syndrome Organization, a 501(c)(3) non-profit family support and resource organization serving 350 families and dedicated to making the future brighter for individuals with Down syndrome and other disabilities in Palm Beach County, Florida. FRIENDS is a Down syndrome family support group serving the Tampa/Brandon area. FRIENDS was formed out of a need for families to connect and lend support while networking and educating each other about Down syndrome. They are a non-profit organization that relies on donations and fundraisers to continue our work in the community. 1) Provide support and information from the best resource; other parents. Families who have children with Down syndrome will help others look beyond their child’s diagnosis and delight in the joys of parenthood. 2) Help families understand the new terminology, services, and supports that will help their child develop successfully. 3) Provide free information on all aspects of Down syndrome in person, by phone, by internet, and by referencing nationally recognized resources. The Fun Coast Down Syndrome Association was started in October of 2002 by Paula Wilburn in an effort to provide services and support to families in Flagler and Volusia counties. Most of us are parents, but we are also grandparents, friends, and professionals. We encourage and support families by offering services and advocating for people with Down syndrome. The mission of this organization shall be to provide support, education and resources to individuals with Down syndrome, their families, and community, in order to foster an environment in which individuals with Down syndrome are included and valued as contributing members of our society. PODS Angels is a non-profit support group organization for parents of Down syndrome. PODS Angels began in 1998 almost 10 years ago after the birth of their beautiful daughter Mariah, she has Down syndrome. PODS Angels Support has been helping families get connected to one other for friendships, support and encouragement. Helping families go thru the maze of Early Intervention services and therapies that are available today has been rewarding and motivating. They continue reaching out on the internet and to the local hospitals and other resources that will continue to keep us connected to the newest parents that need that positive support at the very beginning of their journey to Holland, (a poem) what is often times an uncertain time, especially in the early days. Being a positive support person to families is what drives us! Advocacy skills are something that we as a support group empower parents with. Helping parents learn how to be the BEST Advocates they can be for their child especially during the school IEP meetings! Bringing back old fashioned ‘Tea Parties’ by hosting ‘Advocacy Tea Parties’, parents meeting and learning with other parents. Need help or advice...email us, hopefully they can point you in the right direction for where you are presently. North Central Florida Playgroup is a local support group for families with a child with Down syndrome. Families with children with other developmental delays are also welcome. The Treasure Coast Down Syndrome Awareness Group is here to support families, promote public awareness, network with other organizations and individuals and lobby for appropriate educational, vocational and social opportunities. 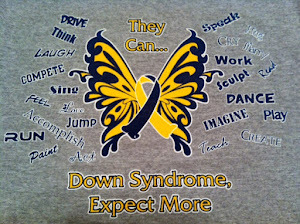 and to promote understanding and acceptance of Down syndrome. Down syndrome and their families. opportunities to contribute and be valued members of society. • Dispel myths, promote positive awareness, and emphasize abilities of people with Down syndrome to parents, educators, physicians, therapists, and the general public. Buddy Cruise provides educational opportunities and resources for families, while promoting awareness, acceptance, and inclusion for individuals with Down syndrome through unique venues. Acton Up With Downs, Inc (AUWDI) is Bay County’s Down syndrome support group. AUWDI is committed to supporting and enhancing the quality of life, and realizing the potential of all people with Down syndrome. We promote awareness, acceptance and inclusion in our community through a variety of services. Upside 2 Downs of Pensacola is an organization that is going to aid and include those with Down Syndrome into society, and not as second class citizens. They are equipping our families and community with this knowledge by offering workshops, monthly support group meetings, community events, TV commercials, and more. When you involve the community and local agencies, they believe that acceptance and inclusion will blend into one. Believe me, there is an UPside to Down Syndrome. This organization is well aware of the special needs of your child and they are available to help you help your child. Their goal is simple, to enhance the lives of individuals with Down syndrome by helping them reach their full potential by providing family support, education and social activities.